Learn Multiplication, Fractions & Division | Do The Math Now! Do The Math Now! focuses on developing understanding and facility with whole numbers and fractions. Content is introduced with a focus on meaning and number sense. By spending time developing unifying ideas, students build deep understanding, learn to reason mathematically, make connections across operations, and apply their skills to higher-level mathematics. 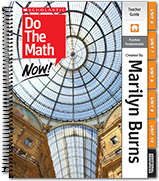 The Multiplication & Division volume of Do The Math Now! strengthens students’ conceptual understanding of the operations and builds their skills with multidigit multiplication and division. Along with developing students’ understanding, this volume helps to build students’ number sense in ways that prepare them for understanding the structures of algebra. The lessons focus on place value to model how numbers can be composed and decomposed and use the properties so students can compute with facility. Throughout the volume, students deepen their conceptual understanding of the meaning of multiplication and division by drawing on real-world contexts and rectangular arrays; actively engaging with the Commutative, Associative, and Distributive Properties of Multiplication; and using visual models of rectangles to represent basic facts. Games, such as Pathways and Target 1000, provide practice, strategic thinking, and practice with basic multiplication facts and multiplying by multiples of 10 through 100. Lessons continually build on students’ developing understanding as they explore the multiplication and division processes and work to make connections and extend their skills. 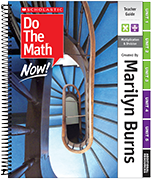 The Fraction Fundamentals volume of Do The Math Now! develops students’ conceptual understanding, building the skills needed to reason, estimate, add, and subtract with fractions. This work is crucial for the later study of proportional reasoning. In order to have success with fractions, students must understand the meaning of numerators, denominators, and the relationships between them. Do The Math Now! helps students to develop mental representations of fractions in order to understand equivalence and how it relates to comparing, ordering, and renaming fractions. Throughout this volume, students use both strip and circle fraction kits to identify, compare, and combine fractions. They learn strategies rooted in understanding and use their fraction kits to deepen their understanding of equivalence, add and subtract fractions, and estimate sums and differences. Games, such as Cover Up, help to build mental representations.